This post is sponsored by Bed Bath & Beyond. All opinions are my own. Spring and summer are full of celebrations for our friends and family. One of my favorite reasons for entertaining is in celebration of an upcoming wedding. Is there anything better than toasting to love? When two of my closest friends got engaged, I thought it would be a great occasion to host a bridal brunch. 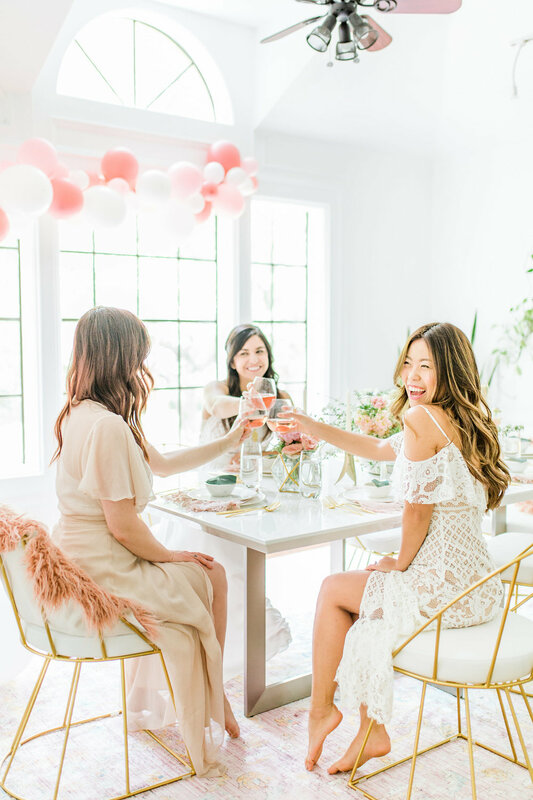 Today, I am sharing a Pinterest dream-come-true styled brunch shoot with 3 simple entertaining tips. This bridal brunch was inspired by plants and nature along with blush and golden delicate details. Hopefully it will inspire your inner hostess to entertain effortlessly with style. A great party starts with great design. It’s key to carry the design elements through multiple areas so the eyes can wander throughout the space. I love setting the scene with fitting furniture. Our colors for this styled bridal brunch shoot was blush, white, gold with greenery details. Bed Bath & Beyond carries an extensive collection of furniture that can be styled for many unique occasions. I love blending the modern styles of the Eurostyle Tosca Dining Table with the geometric golden lines of the LumiSource Canary Dining Chairs. The velvet white seat on the dining chairs created a lot of textural interest. I love highlighting the end seats with Luxe Mongolian Faux Fur Sheepskin Accent Rug in Rose. This brought even more texture to our sleek modern designs. We also drew inspiration for the color palette from the Magnolia Home by Joanna Gaines Ophelia 9'6 x 12'6 Area Rug in Berry/Multi. The blush and gold tones in the Joanna Gains Ophelia rug tied the whole room together. The gold bar cart from Bassett Mirror Company (Fouquet Tea Cart) in a beautiful shade of golden brass was a focal point of the dessert area. I loved carrying the theme throughout the room with this golden modern piece. My favorite highlight was the Madison gold flatware. We have been through 3 sets of gold knives and forks and these are by far the best quality, weight and feel. I also created a specialty drink with rose water, orange sparkling water over DIY rose floral ice cubes. It was the perfect floral touch to bring the organic theme to the table. I worked with the amazing Ode to Joy Flowers to create centerpieces that were free flowing and romantic. The Surya Dyne Ceramic Table Vase had the best texture. We also used gold geometric terrariums (Danya B. Brass and Glass Terrarium) to keep with the golden theme. I rounded out the look with satin golden candle sticks by Nambe (Eco Candlesticks). 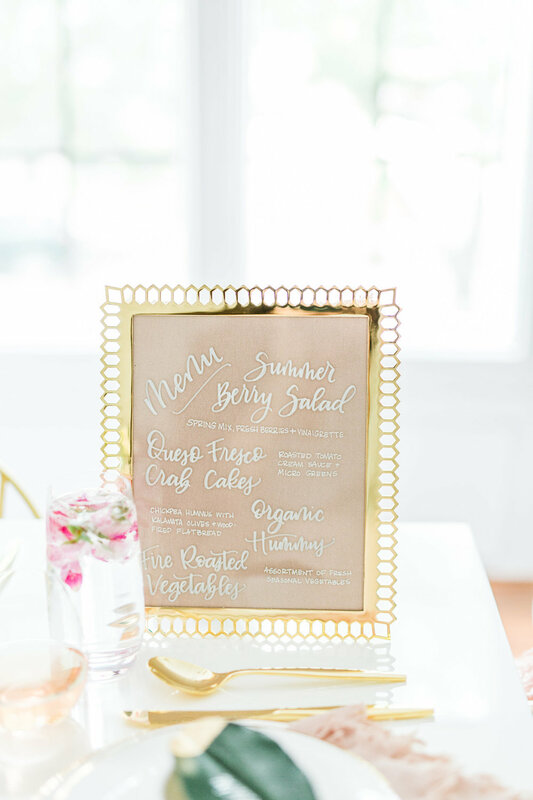 We displayed the brunch menu by placing a napkin inside the Olivia & Oliver Aubrey 8-Inch x 10-Inch Picture Frame in Gold. Kristen from Kirsten Leigh Hand Lettering and Design did beautiful chalk calligraphy on top of the glass. Finally, serving summer salads and creamy crab cakes from Bella Green on Olivia & Oliver Harper Organic Shape Gold 16-Inch Oblong Platter and Gold Serving Bowl made the meals feel extra special. Beside the gorgeous balloon garland that Magnolia Bloom Boutique custom created, the dessert bar is my favorite area! I loved incorporating potted plants as a greenery backdrop. The free flowing vines were grounded by modern lines of the brass bar cart. I often get asked “How do you style a bar cart?” The answer is simple, balance and symmetry is key. The tallest point is the focus so we displayed the gold leaf naked cake on top of the Artisanal Kitchen Supply® White Marble and Wood Cake Stand. 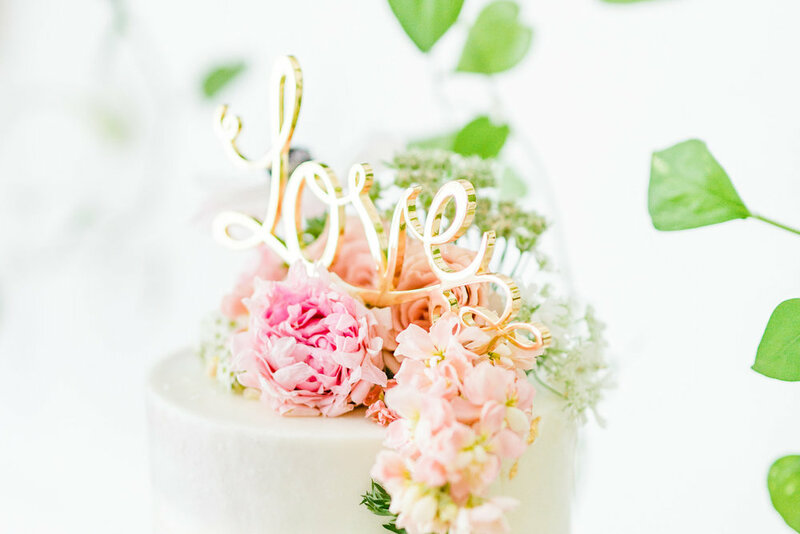 The golden cake topper that says LOVE drew my eyes immediately to the cascading flowers on top of the cake. We also served blush key lime shooters, almond vanilla cupcakes on top of 2 beautiful boards on either side of the cake to create balance. (Artisanal Kitchen Supply® Marble Chopping/Serving Board and Artisanal Kitchen Supply ® White Marble and Natural Agate Paddle Board). The bottom tier, I created balance by placing a large organic flower arrangement on one side and accenting a champagne station on the opposite side. I styled 3 gold rimmed Olivia & Oliver Madison Champagne Flutes on top of a geometric gold tray (Kate and Laurel Felicia Mirrored Nesting Accent Trays in Gold) to keep with the theme. We even color matched the drinks by displaying a blush champagne in the crystal Olivia & Oliver Madison Ice Bucket. I finally tied in the blush from the table scape with the Relaxed Cotton Table Runner to bring another layer of texture. I truly loved bringing this vision to life with the help of Bed Bath & Beyond. They have everything you need to make the next party a memorable event. I cannot wait to browse their vast selection for our next room redesign! A very special thanks to the creative team that made this golden vision come true!